Now in the App Store is Puppy Panic and Puppy Panic HD: The new game for the whole family that lets you collect all the puppies that you can carry! Puppy Panic has two game modes that work together: Collect as many puppies as you can, then become a master at racing them! The better you are at racing your puppies, the more puppies you can earn! Each puppy you unlock has different capabilities, making racing with each puppy unique! Puppy Panic was recently rated as a “Best Ipad App” for families by Famigo, the top family-centric app review site, so you can have confidence when purchasing the game for your young ones! Good clean fun for all ages! Puppy Panic was rated as a best Ipad app for families by Famigo. 10% of all purchases are donated to animal care organizations. Many breeds of puppies to collect and race. Each puppy has unique capabilities. Beautifully animated puppies on colorful hand painted environments. Earn coins to spend in the Pup-O-Matic vending machine. This is where you get new puppies! Addictive gameplay! 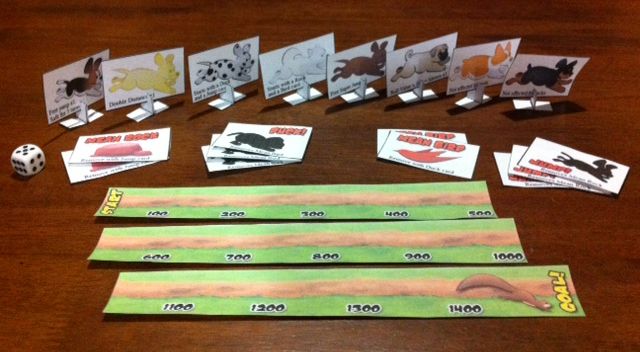 Race your puppies on two different courses and complete objective based gameplay. Unlock unlimited race modes for each puppy, a challenging mode where you race as long as you can. GameCenter support. Ranked leader boards for unlimited mode and forever race distance! Funny and interesting puppy trivia. Super secret unlockable puppy. Can you figure out how to find him? Adoption center where you can choose to purchase individual breeds or additional coins. Free boardgame with the purchase of Puppy Panic! 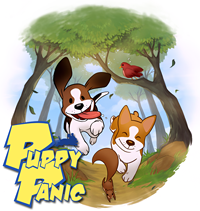 Now when you buy Puppy Panic for your IDevice you’ll also recieve “Puppy Panic: Race to the Finish”, the downloadable Print and Play boardgame version of Puppy Panic. Featuring a different take on the addictive Puppy Panic formula, Race to the Finish focuses on a heated race between you and a friend! Choose your puppy and start your engines for a Race to the Finish! Email us at info(at) theragtagstudio(dot)com and let us know what which puppy is your favorite. We’ll email you a PDF of Race to the Finish.